The official media cliche on Egypt’s revolution is now that it’s “unfinished.” What this means is that revolutionary struggle has now gone on for a year, with an enormous cost not just in bloodshed and death but in psychological horror. A whole generation of previously sheltered, middle-class youth has witnessed murder and suffering up close, in a way that no cadre of young Egyptians has since the 1973 War. Indeed, they’ve seen it closer than their military predecessors: this is no orderly war, with a defined front line that keeps death to itself, the hardened soldiers guarding it like a secret gift. At Maspero, at Mohamed Mahmoud Street, in Port Said, death erupts suddenly, geysering out of nowhere with treacherous, chthonic force. Whatever you can say (and I’ve said it) about the isolated upper- and middle-class backgrounds of many revolutionaries and rights activists, over the last year they’ve lost their cocoons, watched the beaten and the blinded, seen pain in proximity. Mahmoud Salem (aka @Sandmonkey), a well-known liberal campaigner, tweeted as a grim 2012 dawned: “Years from now, when all of this quiets down, I am not sure there is a situation anywhere in the world that we will not be able to handle.” I too hope. has a young bearded face and the haunted eyes of someone who has seen too much. “Since the revolution began, with the exception of the month of August, I’ve lost at least one friend every month,” Hany says. Even before the revolution, Hany was politically active. He used to attend numerous anti-Mubarak protests, when the notorious state security forces would frequently treat protesters violently. But nothing prepared him for what he was about to experience when the uprising began in January 2011. He smelled tear gas for the first time on 25 January of last year, saw the first person die in front of him on 28 January, and visited a morgue to identify a friend for the first time in April. After a year of being on the receiving end of assaults by security forces against protesters, Hany has acquired an uncanny knowledge of the different kinds of weapons being used against him and his friends. There are three kinds of tear gas used on protesters, Hany explains. The one with the red label is manufactured in the US; the one with the blue label is British-made. He also knows that there are two different kinds of rubber bullet: the copper, which comes in six sizes, and the rubber, which only has one size. He knows that a live bullet is 9 mm long, and that a sniper-rifle beams a green light before it hits its target. As time went on, and clashes escalated, Hany and his friends invented new ways to deal with these weapons. At first, they used vinegar and Pepsi to counteract the burning effects of tear gas on their eyes and faces. Later, however, they learned that yeast and medical drips work better. “We learned these things from trial and error. Now, we’re so experienced that we can help the injured more than the medics,” he says. “Some people have also started using face masks to stop themselves from inhaling the gas. But I like doing things old school – I just use my Kuffayah,” he smiles. And after one year of on-again, off-again post-revolutionary violence, Hany has also learned what no one his young age should: what the face of a dying person looks like. “Usually their mouth is open, they look pale, their eyes are unfocused and their breathing is unstable,” he says. Even more horrifying is how well acquainted Hany is with the interior of Cairo’s notorious Zeinhom Morgue. The things that he witnessed in there, he says, will haunt him for the rest of his life. 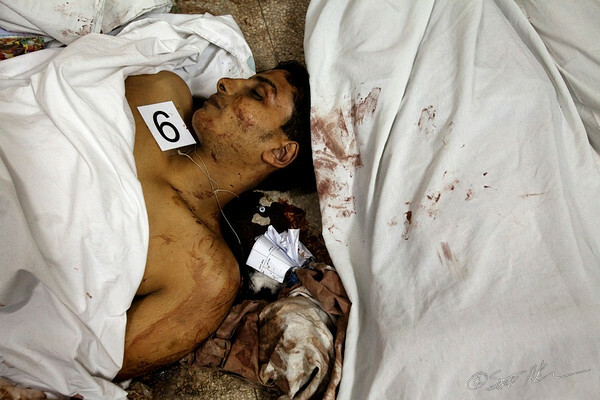 Many of the corpses Hany saw in the morgue bore traces of the as-yet-unidentified gas they were subject to. “Some of them had weird skin eruptions and colours all over their bodies; others had completely lost their facial features,” he recalls. This entry was posted in Human Rights, Politics and tagged Ahmed Harara, Egypt, Maspero, Mohamed Mahmoud, revolution, SCAF, Scott Long, trauma by scottlong1980. Bookmark the permalink.